When it comes to mobile systems, Intel has clearly been ruling the ground firmly with their various Centrino platform variants over time. The entry of Intel Atom further deepened their mobile roots to deliver a platform solution that can meet the demands of the ultra mobility segment, in addition to the Centrino ecosystem taking care of the mainstream and high-end grounds. AMD unfortunately doesn't have quite the complete portfolio of platforms to strike their competitor in all segments. The Turion 64 X2 and Turion X2 Ultra on the AMD M780G platform (Puma) introduced last year greatly helped AMD step ahead to compete in the mainstream arena as well if not better than an equivalent Intel platform. When combined with ATI's Mobility Radeon HD 4000 series of discrete GPUs, they even had the high-end gaming segment covered as well. However the mini-notebook segment was clearly off their charts because AMD didn't want to compromise the user experience which they felt the Intel Atom platform was doing. We agree to that comment to a certain extent since it is true that the chipset that Intel pairs the Atom processor is old and limits the graphical experience of the mini-notebooks. However, we've also noted in our previous assessment of AMD , that they couldn't allocate resources to accommodate this growing segment immediately. Thus to-date, they haven't been able to address this segment of the market, leaving Intel the only real supplier of the largest growing segment of the PC/Notebook market. Today, with the partnership of HP, AMD has brought out their Yukon platform to retail - which partially addresses this area. The Yukon platform consists of an AMD RS690E + SB600 chipset and a single-core AMD Athlon Neo MV-40 (1.6GHz, 512KB L2 cache) or otherwise known as the "Huron" processor by codename. The processor is basically the old Athlon 64 (K8) architecture and brings nothing new other than this model boasting 15 watts TDP and is based on the existing 65nm SOI process technology. While this is a lot higher than the Atom processor's TDP of less than 5 watts, it is also a lot more powerful. Even the chipset is a lot more capable than Intel's ageing 945-series chipset that's often paired with. The AMD Yukon platforms, will however consume a lot more power than a typical mini-notebook and thus it isn't a direct competitor. However, AMD is aiming at a void of affordable ultra-thin notebooks since most notebooks of that form factor are really expensive and is mainly driven by Intel's ULV processors. 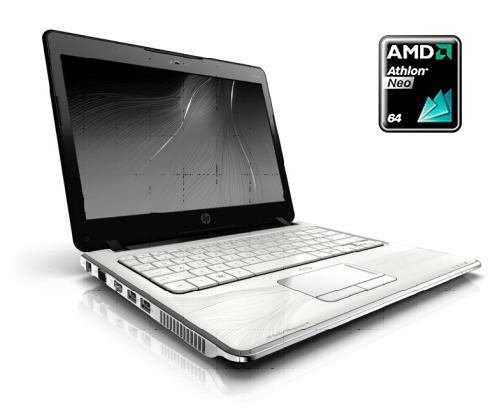 With that, we take a peek at what HP has to offer with their ultra-thin notebook variant using the 'new' AMD Yukon platform. Ivy Bridge: 3rd Gen Intel HD Graphics - Does It Really Matter?